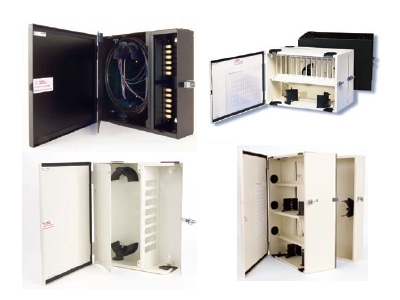 SMP's FiberOpticx Wall Mount Cabinets (WTC) provide a solid foundation for any fiber optic application with features like integrated fiber management and easy cable distribution. Each cabinet may be ordered empty or loaded to meet exact specifications. Every WTC cabinet easily accommodates all cross-connect functions including splicing, termination and interconnects for outside plant backbone and building cables. The WTC series enclosures are scalable, modular and constructed for durability and with SMP's variety of adapter plates, cassette modules and splicing features, the application options are endless.